TAG Heuer challenges three centuries of hairspring/balance wheel mechanical regulation conventions to create a totally new mechanical regulator. The legendary Swiss brand is now unveiling a first Concept version, a 5/10,000th of a second chronograph beating at 1,000 Hz or 7,200,000 beats per hour! 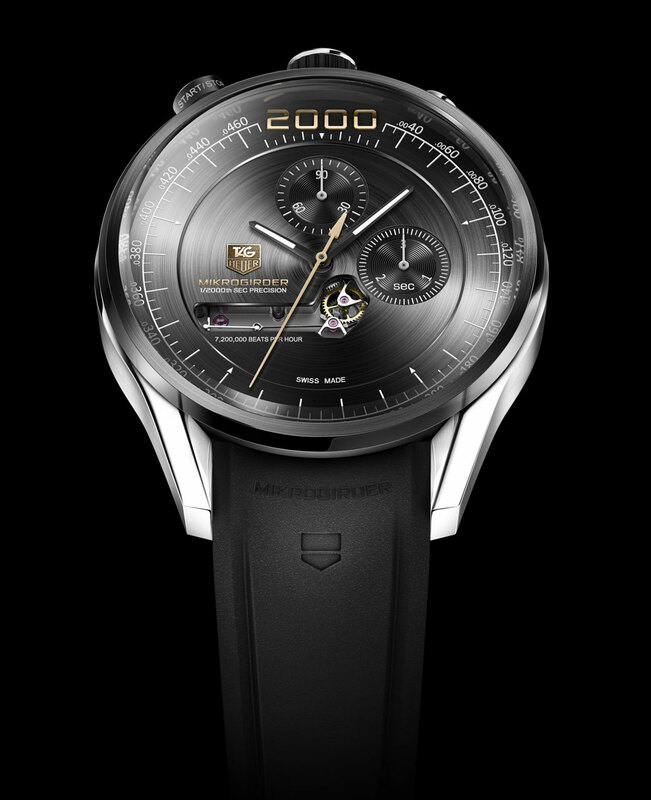 In 2010, TAG Heuer presented the Grand Carrera Pendulum Concept, the world’s first-ever mechanical regulator to replace a conventional hairspring with magnets. 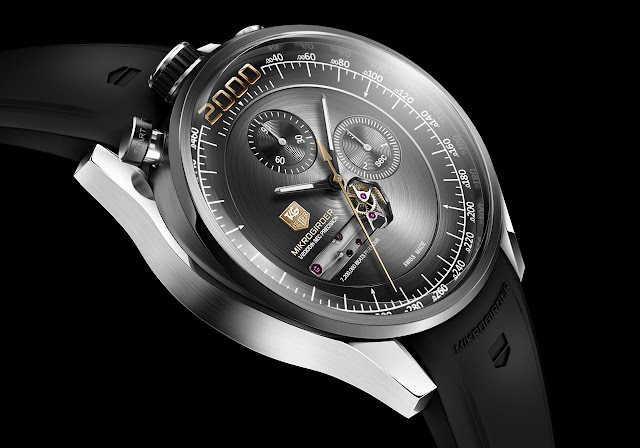 Following TAG Heuer’s Calibre 360 Chronograph (2005), which beats at 50Hz and measures and displays to the 1/100th of a second, the 6Hz Pendulum Concept, which is still under development, confirmed TAG Heuer’s position as the unrivalled pioneer of high frequencies. In 2011, TAG Heuer launched the MIKROTIMER FLYING 1000, the world’s first 500hz mechanical chronograph. A revolutionary mechanical chronograph regulator without any balance wheel system and equipped with two escapements, the Mikrotimer’s beats 3.6 million times per hour, making it 125 times faster than a standard Swiss chronograph. Its central chronograph hand completes a full rotation 10 times per second. Now being successfully commercialized, the Mikrotimer was voted the 2011 Swiss Sports Watch of the Year at the Geneva Watchmaking Grand Prix. The victory marked the 7th time in 10 years that TAG Heuer was singled out by the Geneva jury for its engineering and design prowess. Now comes the pioneering MIKROGIRDER, the Swiss legend’s greatest achievement in watchmaking engineering to date, a game-changing technology which promises to completely revolutionize the very heart of the watch — the regulator. More than the Pendulum or the Mikrotimer, the MIKROGIRDER represents a total departure from the conventional, 3-centuries-old Christiaan Huygens system, which today still reigns over the mechanical watch industry. Accurate to an unprecedented 5/10,000 or 1/2,000th of a second, the MIKROGIRDER is a completely new regulator system — a coupling blade/girder and excitatory blade/girder system working with a linear oscillator (versus a spiral shape in a classical hairspring) that vibrates isochronously at a very small angle, as opposed to a traditional watch, which vibrates at an angle of up to 320 degrees. The advantages are numerous. In a classic spiral hairspring system, the effect of gravity due to mass is a dominant issue. With the MIKROGIRDER, the problem no longer even exists. There is no loss of amplitude and the movement’s frequency can be modulated on a very large spectrum of frequency without overburdening the power supply. The result is a significant increase in precision (division of time) and performance (frequency accuracy and stability). The MIKROGIRDER energy performance will enable TAG Heuer chronographs to attain ultra-high frequencies never before dreamed possible. Ten patents are pending on this breakthrough. The statistics are nothing short of astounding: 1,000 Hz = 1/2000th = 5/10,000th of a second = 7,200,000 beats per hour. 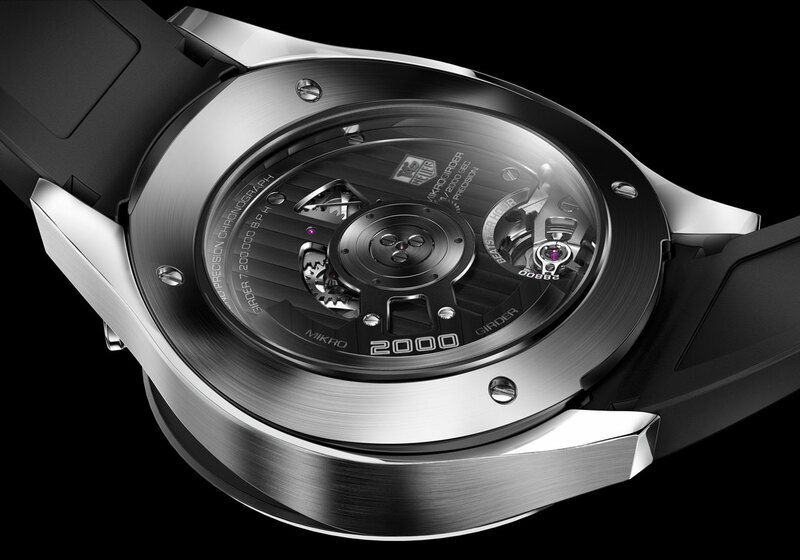 In comparison, a regular watch functions at 4hz, or only 28,800 beats per hour. The MIKROGIRDER is 250 times faster!